What can be more perfect than a leisurely drive down a country road in midsummer, with the verges waist-high in flowers and ferns? Argyll is criss-crossed with many such single-track roads, and a week or so ago we turned down one we hadn’t explored before: the road to Lerags, just south of Oban. The sky was overcast, giving depth and intensity to the thousand shades of green. After a few minutes, an unmistakable shape loomed up to the left, looking for a split second like a distant watchman. Silhouetted against the skyline and rising above a sea of bracken, this was undoubtedly the Lerags Cross. We clambered over the gate and went to take a look. Scotland, especially the west side, is dotted with more ‘high crosses’ than I ever expected when I first came here. Iona perhaps has the finest collection but there are many more, scattered across the mainland and islands. Some of them are gloriously remote, like Kilchoan and Kildalton; some are preserved inside churches, while others, like the Inveraray Cross, now overlook a bustling town. Historically, they are spread over a wide time span. The earliest examples, inspired by the ‘Iona School’, date from about the 8th or 9th century onwards. 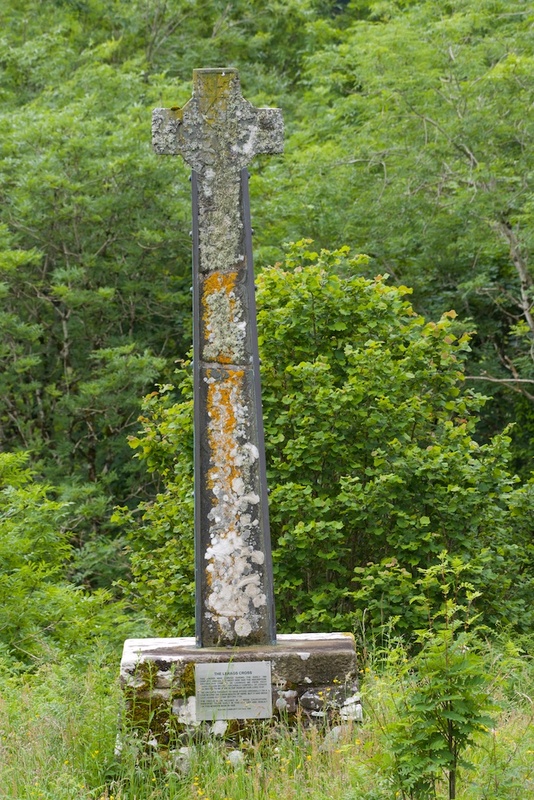 In later centuries, however, there was a fondness among clan chiefs to design and erect a cross in their own name, often sited near a church or monastic settlement. 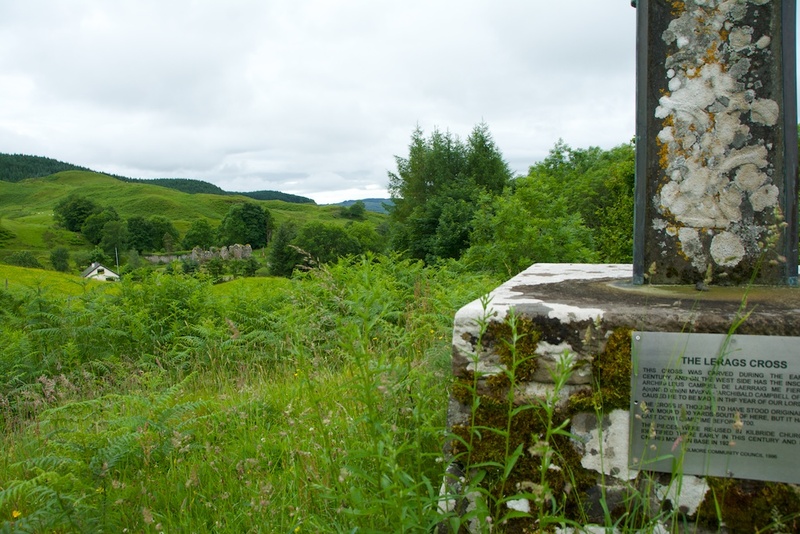 The Lerags Cross, along with the MacMillan Cross at Kilmory Knap and MacDougall Cross at Ardchattan, are good examples of this. For their creators it was an act of piety, with an eye to ensuring that their soul was blessed with daily prayers. Perhaps they also wanted to leave behind something beautiful, in memory of their family and their ties to the land. At the bottom of the west face, according to Undiscovered Scotland, is a panel depicting a unicorn. I have enlarged my photos and inspected them, but this must be totally obscured by lichen and weathering. (You can see it better in an older photo by M E M Donaldson on the Am Baile website.) The eastern side bears Archibald Campbell’s heraldic shield amongst profusely interwoven foliage, which in turn is generously embellished by lichen. The cross is over ten feet tall, and according to a local tradition it was originally located “beside an old road running SE from the coast at Gallanach to the Lowlands…” (Canmore) which crossed the present-day road a few hundred yards further on. However, it may have been a victim of the Reformation in the late 16th century, when the carvings would have been seen as idolatrous. By 1700 it had been broken into three pieces and the fragments lay for two hundred years in the nearby churchyard of Kilbride. 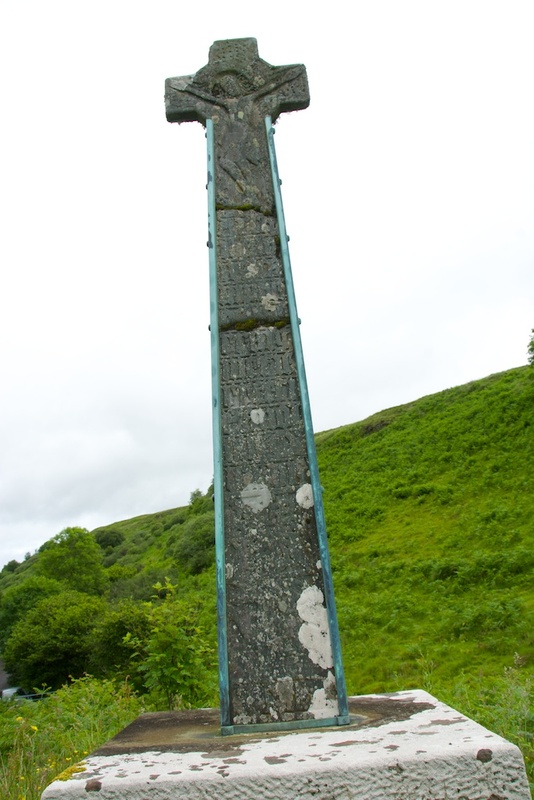 The cross was repaired and erected in its current position in 1926. Because of its metal casing, necessary because of its fragile condition, it’s impossible to tell whether the sides are also carved. It’s likely that they are. From the little mound on which the cross stands, you can gaze down into the valley to the south-west where the ruins of old Kilbride Kirk are visible among the trees. This was our next stop, and how delightful it was. I’ll tell you more in my next post! What a piece of history and a tie to the past! Yes! I love thinking of the people who made it, who would have seen it and admired it. It kind of brings them one step closer! As you say, Lerags Cross (more correctly “crucifix,”:- the figure of the crucified Christ is carved in place) ) was “caused to be made” by Archie Campbell. Archie survived the battle of Flodden hence his piety! It originally stood on a rocky outcrop, just above what is now my home, and alongside what was a drove road taken by cattle from Mull on their way to Stenhousmuir, Stirlingshire. I was told the name of in Gaelic, by local historian, the Late Charles Hunter. I am not a Gaelic speaker, but phonetically Charles called it “An ti Sliochan ” which he translated as “The Place of Prostration.” The Cross was “cast down” as being idolatrous and broken into 3 pieces during the Reformation. It lay undisturbed in Kilbride Kirk yard till early twentieth century, when it was re-erected in its present position, paid for by Public Subscription. In 1736, Clan Chief Iain Ciar (Dark John ) MacDougall, a 1715 Jacobite, was laid to rest just inside what is now The MacDougall Remembrance Aisle at Kilbride. (www.friendsofkilbride.scot) Jean MacDougall, clan historian reports..”. 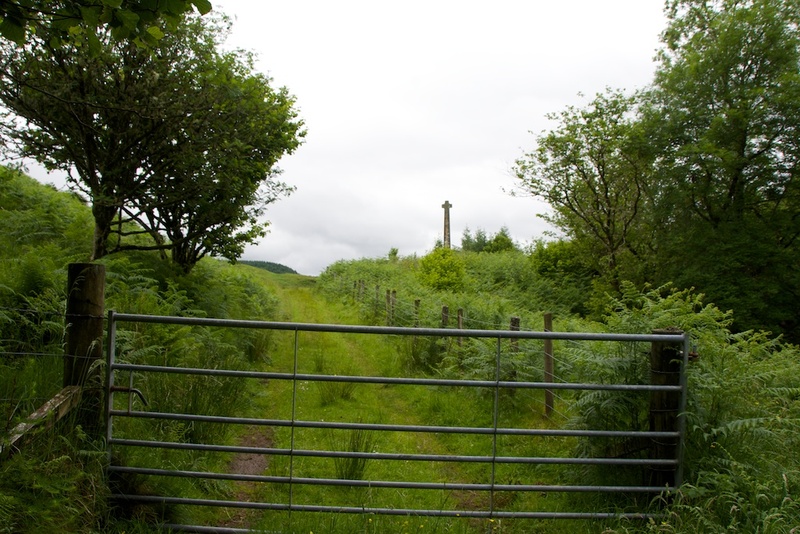 (Iain Ciar) …was buried in the quiet graveyard at Kilbride, where lies broken in 3 pieces the Lerags Cross.” There is an oak bench affixed adjacent to the Lerags Cross. It was made by a local handyman and commemorates a man who had lived nearby. The engraving on the plate fixed to The Lerags Cross had become obscured. At the request of our Community Council, in June 2017, I removed the plate to the studio of Mr. Frank Flannigan, RA who refurbished it. The legend is now fully legible, and the plate has been replaced. ( July 2017) Liam Griffin Friends of Kilbride. That’s very interesting, Liam! I have also received some references from the Clan MacDougall Society about Archibald Campbell and the battle of Flodden. A very understandable reason for the commissioning of the cross. I love the Gaelic name for it, the ‘place of prostration’, which is so evocative. It would be wonderful to just flip back in time and see it as it was when it was first carved and erected. So many generations have passed by and admired it, and no doubt prayed beneath it. Thank you very much for taking the trouble to add this information. Part of the joy of exploring this island of ours is to stop and look at some roadside monument or other, and find out what it’s all about. Or to hunt out particular ones, like this wonderful cross. Almost a timeless design! Thank you for the intro! Most welcome! I’m glad you enjoyed it. I love finding these wonderful old relics too. They so often tell the most fascinating stories. I like the look of the inscriptions. What they read is not what I would expect. Lucky it was found and could be put back together in it’s old spot. Yes, very true, Greg. Who knows how many lovely carvings have been lost! Yes, pretty close to its old spot, and in a beautiful setting – something quite compelling about it. I often wonder what these crosses would have looked like in the times they were erected. In freshly-carved stone, their panels vivid and clear and free from all the lichen and weathering, they must have stood out in the landscape and looked truly magnificent. Yes, so do I wonder, Alen! That reminds me that I saw a post recently about Pictish stones – some historians think the figures/patterns were painted in bright colours. If so, they must have looked amazing. Wonder how long the paint lasted in the Scottish climate! Hi Jo….Now that is another location in Argyll that we have missed (so on the list it goes). Sad it had to be repaired but that said it has been done with good taste and now lives yet another life. Whilst writing can I mention a book that may have past you bye. Published at the end of 2016 (by The In Pinn) and is called “If the Corncrake Calls” it is a compilation of many of the writings of Ian Niall (formerly John McNeillie). Complied by his daughter Sheila Pehrson it is short essays of life in Ayrshire from the early 1900’s. Very much nature based it still carries some good historical narratives of live for country folk. Thanks for that, David! I will make a note – sounds like a great read. I enjoy books like that. Yes, it was so nice to find the cross, and the chapel a bit further on – well worth a drive down that road. Such skill in that carving, you wonder if an artwork like this could be created today. There can’t be many people who could do it. All the different shades of green in the countryside at the moment are wonderful, as you say. That’s very true, Lorna – they were skilled craftsmen, definitely. It was a labour of love. Yes, I guess there’s an upside to all the drizzly rain! The hedgerows are so lush with greenery.